Puerto Rico’s continued financial mismanagement led to a deficit of over $600 million in 2015, adding to the island territory’s ongoing debt crisis, according to the government’s long delayed and only recently released 2015 financial statements. The financial statements, released three years after the close of the 2015 fiscal year, show that Puerto Rico continued its decades-long practice of underestimating its expected tax revenue and exceeding its budgeted expenditures, followed by the issuance of bonds to stay afloat when the coffers run dry. As a result of Puerto Rico’s financial mismanagement, the island territory is currently drowning in roughly $73 billion in debt in the form of outstanding bonds — a debt of nearly $17,000 per capita. The underlying issues to the debt crisis are decades in the making, long before Hurricane Maria devastated the island in September. “It’s a long and historical trend of overspending, under-collecting of taxes and not raising taxes when they need more money,” Puerto Rico Clearinghouse bond researcher Cate Long told The Daily Caller News Foundation. Cities and states typically release their financial statements 200 calendar days after the close of the fiscal year, but it took nearly 1,100 days for Puerto Rico to release its 2015 financial statements. The statements show that Puerto Rico fell $650 million short of its budgeted revenue target in 2015, but only reduced its expenses by $170 million, resulting in a deficit of over $600 million. “State governments, local governments, they all have to run balanced budgets, and this happens constantly when their revenues come in lower or they come in higher, so they often make mid-year adjustments,” Long told TheDCNF. 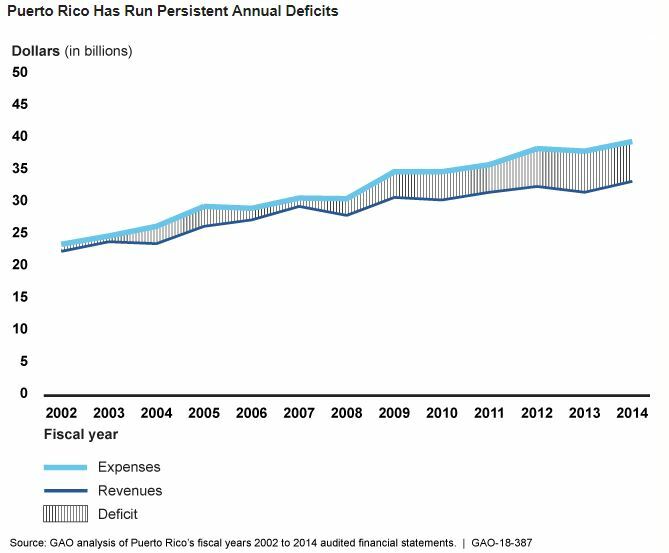 Puerto Rico overestimated its revenue in eight of 13 years between 2002 to 2014, the Government Accountability Office reported in May. The GAO also found that the territory consistently spent in excess of its budgeted expenditures by an average of $459 million annually. It is “highly unusual” for state governments to spend beyond appropriated amounts like Puerto Rico has, according to state and local experts who spoke with the GAO. Contributing to the island’s revenue challenges are decades of high unemployment. The unemployment rate in Puerto Rico dipped under 10 percent for the first time since 2000 in April, according to the Bureau of Labor Statistics. The largest chunk of Puerto Rico’s spending in 2015 was directed towards education. But the island government isn’t producing positive results, despite its $3.1 billion annual investment in the education of its children. “I don’t have a problem with spending a lot on education, but the results are horrible there,” Long said. Only 10 percent of seventh, eighth and 11th grade Puerto Rican students achieved proficiency in a standardized math test in 2017, according to The New York Times. Puerto Rico filed its 2015 financial statements two years after President Barack Obama signed into law the Puerto Rico Oversight, Management and Economic Stability Act, or PROMESA, to help the territory restructure its debilitating debt. Utah Republican Rep. Rob Bishop filed a friend of the court brief over the weekend, calling on the First Circuit Court of Appeals to facilitate proper interpretation of PROMESA in hopes of finally remedying the “decades of financial mismanagement that led to the present crisis” in Puerto Rico. Bishop chairs the House Committee on Natural Resources, which oversees Puerto Rico. Puerto Rico’s representative in the House, Jenniffer González-Colón, introduced a bill last week that would make Puerto Rico a state by no later than the first day of 2021. The bill has 37 mostly Republican co-sponsors. Some 97 percent of Puerto Ricans voted in favor of statehood last year, but only 23 percent of eligible voters participated in the nonbinding referendum. Puerto Rican statehood hinges on the passage of a congressional statute and a signature from President Donald Trump.